Jaipur, December 4: The Second Edition of Rajasthan Heritage Week celebrating ‘Handmade in Rajasthan’ ended on a high note at the Diggi Palace Hotel, Jaipur. The, five-day Craft Pavilion, including a three-day fashion extravaganza highlighted the modern luxury and the beauty of heritage textiles. The exhibition has embarked a new idea and definition to khadi, block printing and other traditional crafts. 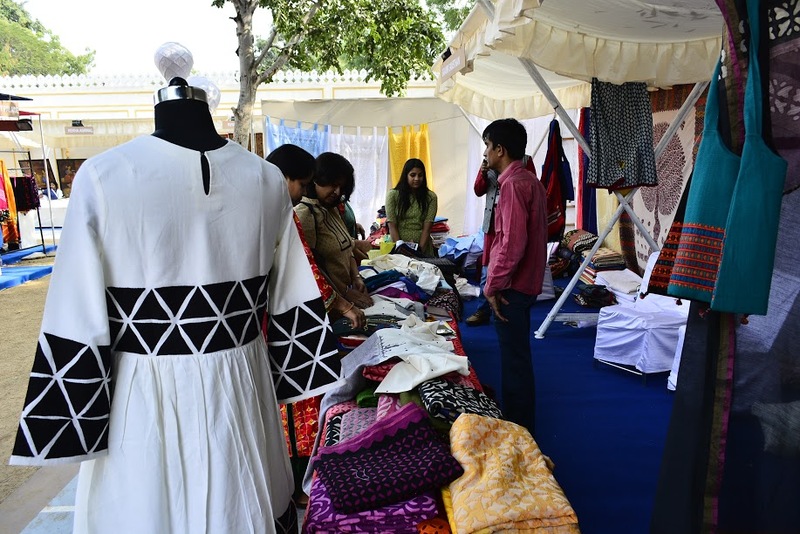 There were over 20 stalls of different artisans and designers from all over Rajasthan who were a part of the Pavilion. The exhibition also had Modern Miniature Paintings, silver jewellery, Shibori & Bandhani, Tibetan silver jewelry, Mughal Garden Block Prints Wearables, Appliqué and Patchwork craft, Block Printed Footwears amongst many others. Several engaging activities like hands on block printing and live lac jewellery attracted the crowd to the festival on Sunday. Visitors arrived to catch a glimpse of the National Awardee weavers, artisans and Lac workers demonstrating their skills. Several design institutes like Arch, IICD, Pearl Academy also initiated to promote khadi. Various designers like Mr. Ankesh choose to exhibit simply to promote khadi. Also a city based designer Dr Sanjay Aggarwal has tried to bring together chic and modern block prints with khadi. Mr. Riyaz uddin, who has also worked for Swatch is specialised in contemporary miniature artist was also one of the exhibitors who participated. Mr Kheemraj Nandlal Rathi, an artisan from Barmer who had exhibited rajasthani textile said that before there were only 4-7 customers that he had from Delhi, but now exhibition and craft fair like has provided him a platform to showcase his work, he is overwhelmed with the response and appreciation from the visitors. This unique endeavour to revive the glory of Khadi concluded with the promise to glorify it even more in the next year. It is to be recalled that the second edition of Rajasthan Heritage Week was jointly being organized by Khadi Board, Government of Rajasthan and Prasad Bidapa Associates at Hotel Diggi Palace in Jaipur. The five day fashion extravaganza was a unique endeavor to revive the traditional handmade traditional textiles and the beauty of Khadi.